Product #18397 | SKU EB-424L | 0.0 (no ratings yet) Thanks for your rating! 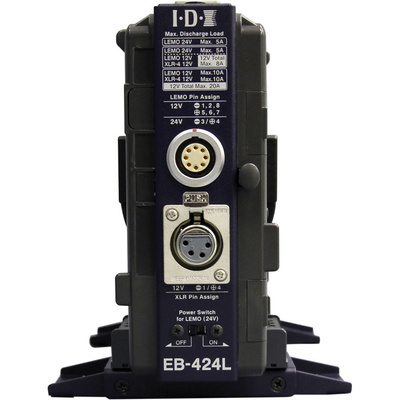 The IDX EB-424L V-Mount Power Base Station is a field-portable lithium-ion battery, which supports up to 8 ENDURA batteries to power up to 744Wh in PowerLink or dual stack mode on 4 V-Mount plates. Used in environments where voltage and current capacity are a challenge, it is compatible with high-end broadcast camera systems such as Sony F23, Sony F35, and RED ONE. The batteries can be changed over without interrupting the normal operation. If the main AC is disconnected or fails at any point of time, the power base mode provides a battery backup to prevent any loss of critical production material or shooting delay. The base station comes with 2 output terminals - industry standard 12V and professional 24V. A dedicated 24V output switch allows selection of the output voltage of the LEMO connector; it can be used separately or simultaneously. Depending on cable/pin configuration, the 12V output is continuous from both the LEMO and XLR connector (when the 24V switch is active). The maximum current is 20A for 12V (10A each output), and 5A for 24V. The base station features a LED indicator for 24V output, which includes detection of protection circuit and dual low voltage warning when below 14V and 12V. The lightweight (approx. 2.87 lbs) Power Base Station has a compact size, and comes with an extendable feet up to 5.04" (W), making it suitable for use in studio and desktop surfaces. Selection of 12V or 24V output voltage of the LEMO connector via a dedicated 24V output switch.